Experience the latest trends in home design from Germany, Spain, Italy, Austria, and beyond without leaving Boston. 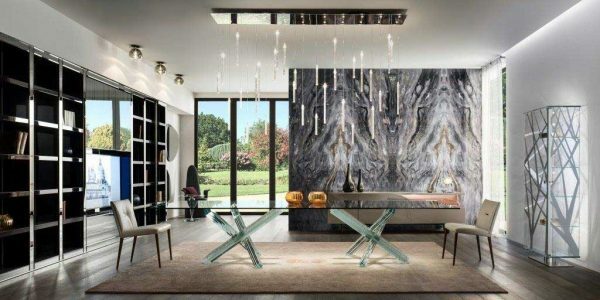 To step inside this city’s largest European showroom is to be transported to somewhere more likened to the Milan iSaloni Fair– where all aspects of interior design and cutting-edge technology combine and come alive. Here at Divine, Just a walk-through can be “world”-changing for both furniture enthusiasts and home renovators alike. 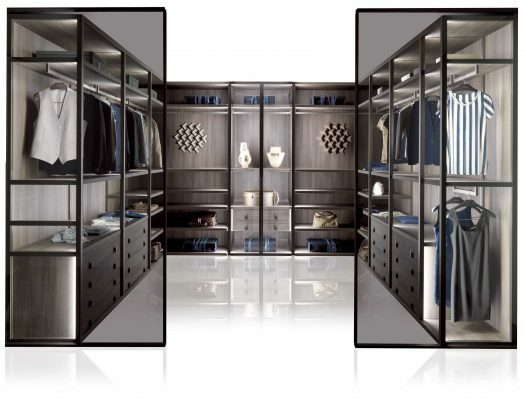 For both inquiring minds and home re-designs, the Divine showroom features floor to ceiling wardrobes affixed with motion-censored interior lights, glossy sliding doors, and smoke-y mirrors that turn to light (or rather clear) only to reveal one’s clothes behind. 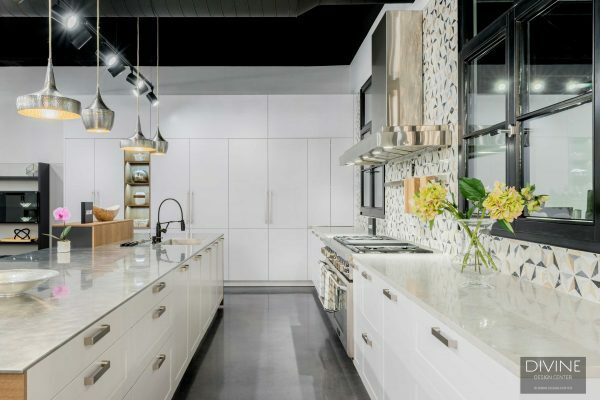 In a similar fashion, modern kitchens with hydraulically ran, rising islands, induction cooktops and seamlessly installed, paneled dishwashers beckon clean lines, and visions of modern kitchen desires. 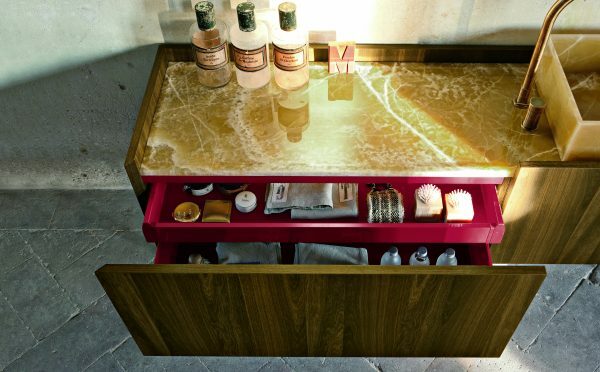 Additionally, Divine Design Center curates the total living concept with innovative materials found even in their showroom’s nod to the spa. For what interior is complete without attention to every detail? Bathtub included. Whether one is looking for a set of dining room chairs, or to renovate their whole home, Divine provides their clients with any and all of the above. Enter Divine’s airy waterfront showroom for a full range of interior needs. From a new sofa, or coffee table to a steam oven, Divine caters to all aspects of the home. Keeping in mind, all tastes and styles are always welcome. 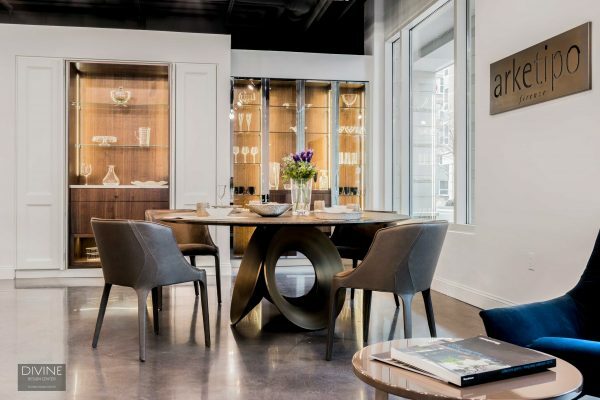 Divine’s staff of award-winning designers and architects create spaces suited to the wants and needs of their clients, and even provide optional installation services as well. Instead of out sourcing your time to various subcontractors and installers — Divine can do that for you too, thanks to their own on-hand team of certified installation + construction experts. In design circles, Altamarea is the name for rare, precision-cut precious stone for the bath. Rare woods and burnished metals provide solid foundations for flawless onyx, marble and choice stone bath ware. Altamarea pieces create an Ionic atmosphere, with sensual bath designs hewn from the earth. Arrital adheres to quality, and their 100% made in Italy certificate. 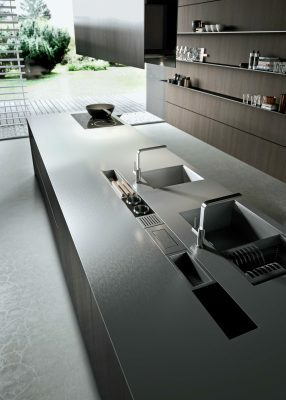 This Italian kitchen company produces ideal home solutions that transcend all tastes and styles. From the traditional to the ultra-contemporary, Divine’s designers in cooperation with Arrital Cucine can accommodate your dream kitchen. They say the eyes are the windows to the soul. But, what they should really say is that modern doors are windows into a soulful home. Thus, recent innovations in modern doors and room-dividing systems grant inquiring homeowners the perfect key to their modern home. 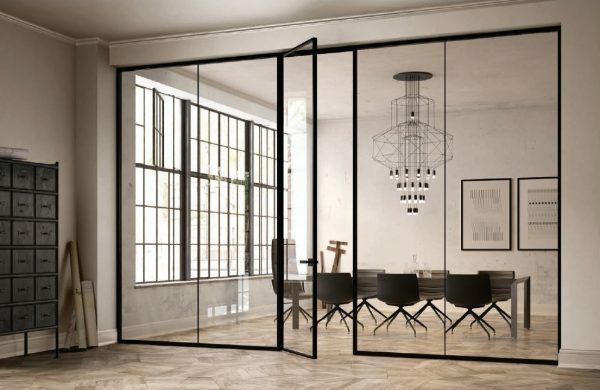 With this in mind, many are turning to companies such as ALBED to solve their modern-door desires. Furthermore, ALBED works in developing top-of-line modern doors with functional, innovative designs. ALBED’s doors are integrated seamlessly into the modern home while working efficiently with its material surroundings. Similar to this feature’s predecessors, MisuraEmme upholds their “Made in Italy” brand, and has done so since 1902. 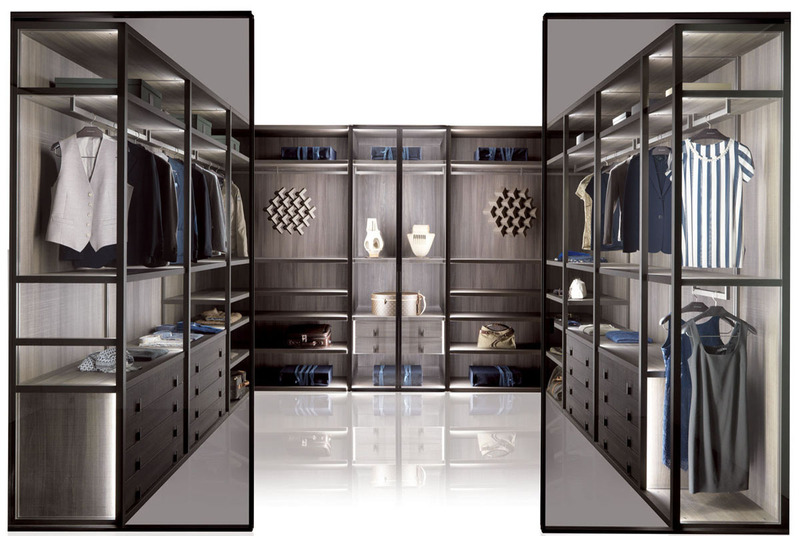 For three generations, this Italian company has brought devastating furniture designs and sought-after wardrobe configurations to market. When you hear the Reflex Angelo name, you’re privy to the highest level of Venetian craftsmanship. We’re talking the luxe of the deluxe. These are the makers of what does not yet exist: impact furniture and the focal-point pieces to crown any room. In Italy, and in Boston, you can’t do any better. From humble beginnings in the 1940’s, this family glassworks has risen to the peak of chic. While Tuscany is totted on its sunflowers and fine wines, it also brings to light heavy hitters in the interiors game. Exhibit A, Arketipo Firenze. This “Made in Tuscany” brand offers furniture that provides both form and function. From the playful to the refined, all pieces from the Arketipo lines ensure a lifetime of quality in wear. For those who refuse to settle with an off-track drawer or a loose cabinet door, there is a German kitchen designer for you, right here. Take your time at the LEICHT display kitchens, for the thrill of testing perfectly crafted drawers and cabinets. From hinge to knob, this is the pinnacle of German design and engineering, folks. Eighty years of custom-fitted, custom-color kitchen design has made LEICHT the choice by those in the know. Test drive a Rolf Benz sofa for out-of-this-world comfort. These pieces are lovingly hand-crafted in Nagold, Germany using only wood, leather and pure textiles. This is obviously not 1-800-FURNITURE. Rolf Benz pieces are recognized worldwide for comforting softness, original beauty and functionality, and they last practically forever. Team 7 grows their own trees. Doesn’t that say quite a bit about the company’s dedication to sustainability. The end result is pure wood furniture with soul and character, masterfully fitted pieces, combining nature, design and technology. Founded in 1959 and owned by the son of a saw miller, Team 7 is an award-winning choice for the finest wooden tables, chairs and shelves, guaranteed (no need to knock on wood). Ergonomics, balance and precision are the key drivers at Muebles de cocina DOCA. Even the most demanding homeowner discovers DOCA is the best, not just in Spain, but everywhere. Thirty years of making reliably perfect counters and storage cupboards has galvanized their reputation. Never dull or one-dimensional, you’ll see striking creativity in their works. And work they do; on a daily basis, in busy households, brilliantly and effortlessly, for a lifetime. 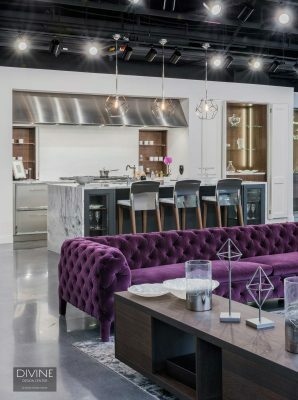 If there’s a magic wand for home renovation, Divine Design Center certainly wields that wizardry. 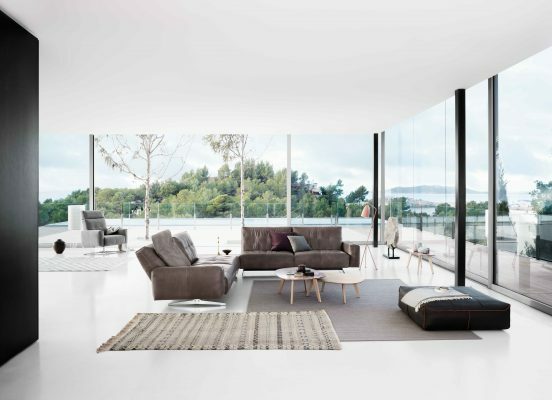 On top of their established capabilities, they’ve outdone themselves with this singular showroom of European-designed transformations. 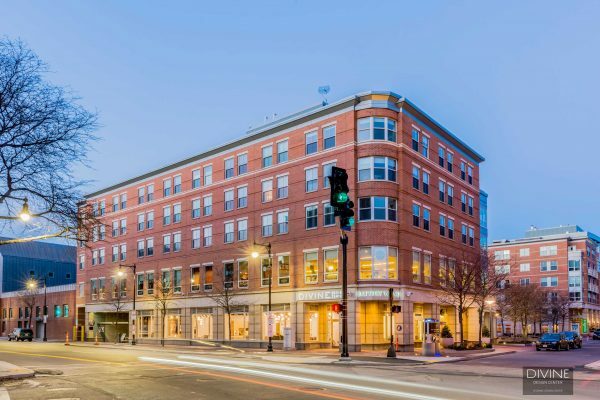 For an au courant tour of European home design, travel no further than Boston’s North End.